Major discovery ! Major discovery !Major discovery ! Important things must say 3 times ! 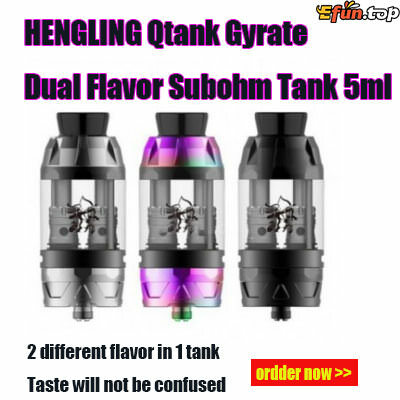 The latest HENGLING Qtank Gyrate Dual Flavor Subohm Tank is right here for you! This innovative tank enables you to enjoy two e-juice at the same time. You can switch the flavor by a simple gyration! It also features top refill design and adjustable bottom airflow. It adopts cooling system in drip tip to avoid lip-burning. The Qtank will bring best vaping performance to you!